A quiet bohemian resort near Spain’s border with France, white-washed Cadaquès is a Mediterranean postcard come to life. A former fishing village is now known as an artists’ hotspot, Cadaquès was the stomping ground of Salvador Dalí and has hosted the likes of Pablo Picasso, Joan Miró and Man Ray. Its allure is obvious: pale jagged cliffs form the shoreline, sailboats and fishing boats dot the sea, gentle waves lap at pebbly beaches, and low white buildings huddle together in the knot of a town center. In the village itself, narrow cobblestone lanes run alongside balconies brimming with bright geraniums. At the heart of town is the village church, which stands like a watchtower overlooking the sea. Cadaquès sits on a sweeping natural bay at the northernmost reaches of the Costa Brava, a stretch of coastline considered one of Spain’s top seaside destinations. Among the many resort towns in the area, this is one of the few that has managed to avoid excessive tourism and retain its sleepy air. Perhaps the masses have been kept away by the fact that pebbly shores take the place of a long sandy beach, and that the trip here involves a long, curvy highway. Those who do make the effort to come are rewarded with lovely sea views and an energetic town life brimming with galleries, shops, and cafés. This area is famous as being artist Salvador Dalí’s home for half a century. Portlligat, a hamlet, is a 15-minute stroll from Cadaquès, was the surrealist’s base from 1930 until 1982. More than merely a house, the home he shared with his muse and lover Gala is a labyrinthine collection of fishermen’s huts that Dalí joined and re-decorated over the years, converting them into an enormous work of art. Today, the Casa Dalí is open for visits and is a must-see for anyone visiting Cadaquès. Cadaquès is also a hot spot for outdoor activities like hiking, canoeing, biking, sailing, scuba diving, and summertime beach bathing (although the rocky coast often means that strolling is more enjoyable). Stretching away from Cadaquès is the small wine-making DO of Empordà-Costa Brava. Running along the French-Spanish border and down the rocky Mediterranean coast, this is an experimental region where everything from Carieña rosé wines (the traditional wine made here) to Tempranillos, Cabernet Sauvignons, Chardonnays and Syrahs are made. The best-known winery is Castillo Perelada, a modern winemaking facility that also includes a lovely ancient castle, restaurant, hotel, and wine spa. Other notable Empordà-area wineries include Castillo de Capmany, Masia Serra, Oliveda, and Pere Guardiola. Encircling Cadaquès like a blanket is the protected natural park of Cap de Creus, one of the largest parks in Catalunya. Including the rugged hills surrounding Cadaqués as well as a large swath of coastline, the park protects both marine and land flora and fauna. This is a wonderful area for hiking and scuba diving. Pere de Ribes Although it’s been 200 years since the Sant Pere de Ribes monastery housed monks, the retreat’s millennium-plus-long history and quiet holiness still haunt the air. Monks believed Saint Peter’s (he of Pearly Gate fame) skull and right arm are hidden in a cave somewhere on the mountain near the monastery, making the site holy. The monastery is located within the Cap de Creus natural park. Just down the coast from Cadaquès sits this quaint fishing village, where fishermen still mend their nets by the sea and fishing boats often outnumber pleasure boats in the water. The gateway to the Cap de Creus natural park, Port de la Selva also boasts wonderful seafood restaurants and a long, pretty beach. 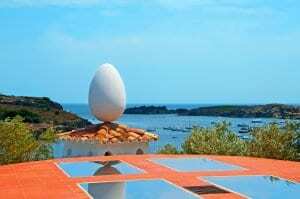 A mere 1.5km from Cadaquès, in a fishing hamlet called Portlligat, lies the whimsical and maze-like house of surrealist artist Salvador Dali, who lived here with his muse and lover Gala until 1982. Artwork-in-progress, fanciful sculptures, unique design elements, and furniture and accents designed by Dalí fill the house, making this one of the top sights in Cadaquès.